I HAVE never known my friend to be in better form, both mental and physical, than in the year ’95. His increasing fame had brought with it an immense practice, and I should be guilty of an indiscretion if I were even to hint at the identity of some of the illustrious clients who crossed our humble threshold in Baker Street. Holmes, however, like all great artists, lived for his art’s sake, and, save in the case of the Duke of Holdernesse, I have seldom known him claim any large reward for his inestimable services. So unworldly was he—or so capricious—that he frequently refused his help to the powerful and wealthy where the problem made no appeal to his sympathies, while he would devote weeks of most intense application to the affairs of some humble client whose case presented those strange and dramatic qualities which appealed to his imagination and challenged his ingenuity. In this memorable year ’95 a curious and incongruous succession of cases had engaged his attention, ranging from his famous investigation of the sudden death of Cardinal Tosca—an inquiry which was carried out by him at the express desire of His Holiness the Pope—down to his arrest of Wilson, the notorious canary-trainer, which removed a plague-spot from the East-End of London. Close on the heels of these two famous cases came the tragedy of Woodman’s Lee, and the very obscure circumstances which surrounded the death of Captain Peter Carey. No record of the doings of Mr. Sherlock Holmes would be complete which did not include some account of this very unusual affair. Our visitor was an exceedingly alert man, thirty years of age, dressed in a quiet tweed suit, but retaining the erect bearing of one who was accustomed to official uniform. I recognised him at once as Stanley Hopkins, a young police inspector for whose future Holmes had high hopes, while he in turn professed the admiration and respect of a pupil for the scientific methods of the famous amateur. Hopkins’s brow was clouded, and he sat down with an air of deep dejection. “I have a few dates here which will give you the career of the dead man, Captain Peter Carey. He was born in ’45—fifty years of age. He was a most daring and successful seal and whale fisher. In 1883 he commanded the steam sealer SEA UNICORN, of Dundee. He had then had several successful voyages in succession, and in the following year, 1884, he retired. After that he travelled for some years, and finally he bought a small place called Woodman’s Lee, near Forest Row, in Sussex. There he has lived for six years, and there he died just a week ago to-day. “There were some most singular points about the man. In ordinary life he was a strict Puritan—a silent, gloomy fellow. His household consisted of his wife, his daughter, aged twenty, and two female servants. These last were continually changing, for it was never a very cheery situation, and sometimes it became past all bearing. The man was an intermittent drunkard, and when he had the fit on him he was a perfect fiend. He has been known to drive his wife and his daughter out of doors in the middle of the night, and flog them through the park until the whole village outside the gates was aroused by their screams. “He was summoned once for a savage assault upon the old vicar, who had called upon him to remonstrate with him upon his conduct. 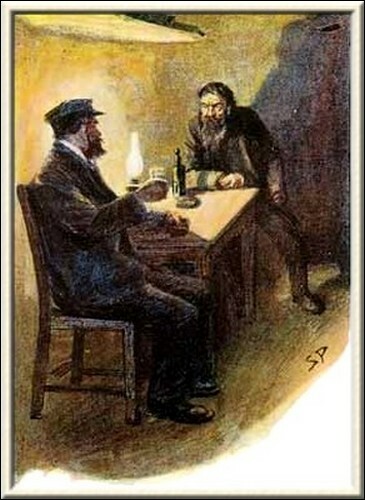 In short, Mr. Holmes, you would go far before you found a more dangerous man than Peter Carey, and I have heard that he bore the same character when he commanded his ship. He was known in the trade as Black Peter, and the name was given him, not only on account of his swarthy features and the colour of his huge beard, but for the humours which were the terror of all around him. I need not say that he was loathed and avoided by every one of his neighbours, and that I have not heard one single word of sorrow about his terrible end. “You must have read in the account of the inquest about the man’s cabin, Mr. Holmes; but perhaps your friend here has not heard of it. He had built himself a wooden outhouse—he always called it ‘the cabin’—a few hundred yards from his house, and it was here that he slept every night. It was a little, single-roomed hut, sixteen feet by ten. He kept the key in his pocket, made his own bed, cleaned it himself, and allowed no other foot to cross the threshold. There are small windows on each side, which were covered by curtains and never opened. One of these windows was turned towards the high road, and when the light burned in it at night the folk used to point it out to each other and wonder what Black Peter was doing in there. 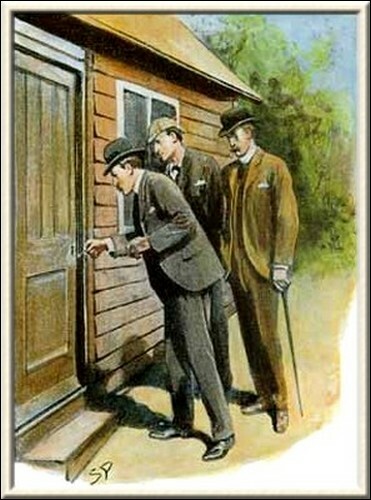 That’s the window, Mr. Holmes, which gave us one of the few bits of positive evidence that came out at the inquest. “You remember that a stonemason, named Slater, walking from Forest Row about one o’clock in the morning—two days before the murder—stopped as he passed the grounds and looked at the square of light still shining among the trees. He swears that the shadow of a man’s head turned sideways was clearly visible on the blind, and that this shadow was certainly not that of Peter Carey, whom he knew well. It was that of a bearded man, but the beard was short and bristled forwards in a way very different from that of the captain. So he says, but he had been two hours in the public-house, and it is some distance from the road to the window. Besides, this refers to the Monday, and the crime was done upon the Wednesday. “On the Tuesday Peter Carey was in one of his blackest moods, flushed with drink and as savage as a dangerous wild beast. He roamed about the house, and the women ran for it when they heard him coming. Late in the evening he went down to his own hut. About two o’clock the following morning his daughter, who slept with her window open, heard a most fearful yell from that direction, but it was no unusual thing for him to bawl and shout when he was in drink, so no notice was taken. On rising at seven one of the maids noticed that the door of the hut was open, but so great was the terror which the man caused that it was midday before anyone would venture down to see what had become of him. Peeping into the open door they saw a sight which sent them flying with white faces into the village. Within an hour I was on the spot and had taken over the case. 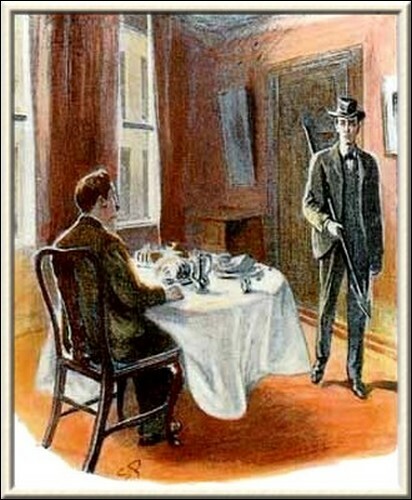 “Well, I have fairly steady nerves, as you know, Mr. Holmes, but I give you my word that I got a shake when I put my head into that little house. It was droning like a harmonium with the flies and bluebottles, and the floor and walls were like a slaughter-house. He had called it a cabin, and a cabin it was sure enough, for you would have thought that you were in a ship. 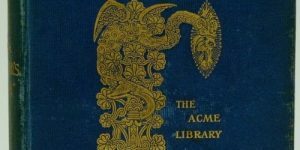 There was a bunk at one end, a sea-chest, maps and charts, a picture of the SEA UNICORN, a line of log-books on a shelf, all exactly as one would expect to find it in a captain’s room. And there in the middle of it was the man himself, his face twisted like a lost soul in torment, and his great brindled beard stuck upwards in his agony. 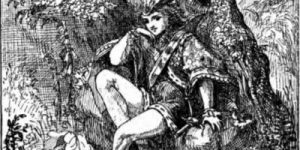 Right through his broad breast a steel harpoon had been driven, and it had sunk deep into the wood of the wall behind him. He was pinned like a beetle on a card. Of course, he was quite dead, and had been so from the instant that he had uttered that last yell of agony. The young inspector winced at my companion’s ironical comments. Stanley Hopkins drew from his pocket a drab-covered note-book. The outside was rough and worn, the leaves discoloured. 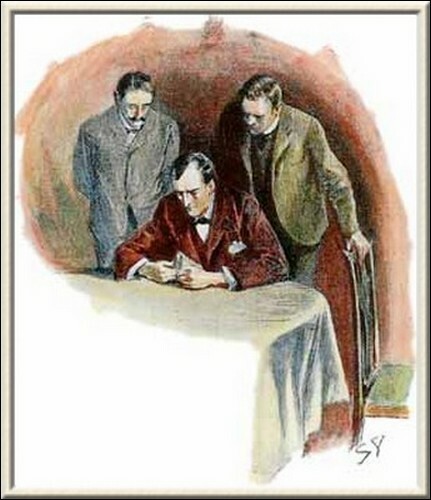 On the first page were written the initials “J.H.N.” and the date “1883.” Holmes laid it on the table and examined it in his minute way, while Hopkins and I gazed over each shoulder. 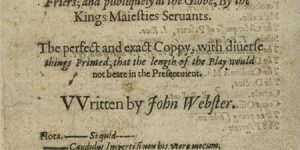 On the second page were the printed letters “C.P.R.,” and then came several sheets of numbers. Another heading was Argentine, another Costa Rica, and another San Paulo, each with pages of signs and figures after it. “What do you make of these?” asked Holmes. “Try Canadian Pacific Railway,” said Holmes. 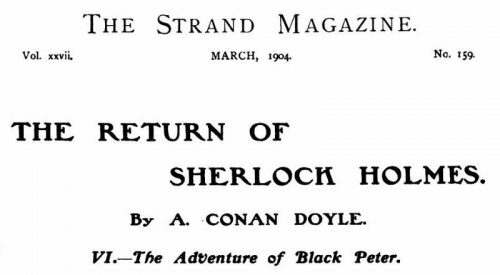 Sherlock Holmes’s face showed that he was thoroughly taken aback by this new development. “Surely there is some discolouration here,” said he. Alighting at the small wayside station, we drove for some miles through the remains of widespread woods, which were once part of that great forest which for so long held the Saxon invaders at bay—the impenetrable “weald,” for sixty years the bulwark of Britain. Vast sections of it have been cleared, for this is the seat of the first iron-works of the country, and the trees have been felled to smelt the ore. Now the richer fields of the North have absorbed the trade, and nothing save these ravaged groves and great scars in the earth show the work of the past. Here in a clearing upon the green slope of a hill stood a long, low stone house, approached by a curving drive running through the fields. Nearer the road, and surrounded on three sides by bushes, was a small outhouse, one window and the door facing in our direction. It was the scene of the murder! “Someone has been tampering with it,” he said. “Some curious person from the village, perhaps,” I suggested. It was past eleven o’clock when we formed our little ambuscade. 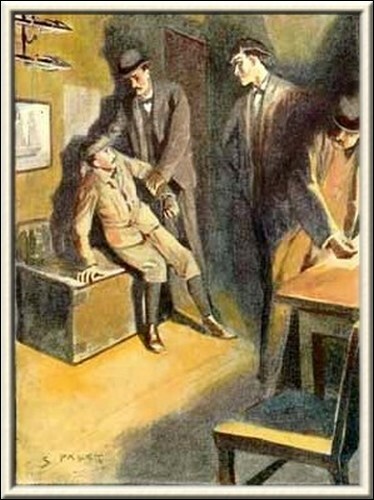 Hopkins was for leaving the door of the hut open, but Holmes was of the opinion that this would rouse the suspicions of the stranger. The lock was a perfectly simple one, and only a strong blade was needed to push it back. Holmes also suggested that we should wait, not inside the hut, but outside it among the bushes which grew round the farther window. In this way we should be able to watch our man if he struck a light, and see what his object was in this stealthy nocturnal visit. The nocturnal visitor was a young man, frail and thin, with a black moustache which intensified the deadly pallor of his face. He could not have been much above twenty years of age. I have never seen any human being who appeared to be in such a pitiable fright, for his teeth were visibly chattering and he was shaking in every limb. He was dressed like a gentleman, in Norfolk jacket and knickerbockers, with a cloth cap upon his head. We watched him staring round with frightened eyes. Then he laid the candle-end upon the table and disappeared from our view into one of the corners. He returned with a large book, one of the log-books which formed a line upon the shelves. Leaning on the table he rapidly turned over the leaves of this volume until he came to the entry which he sought. 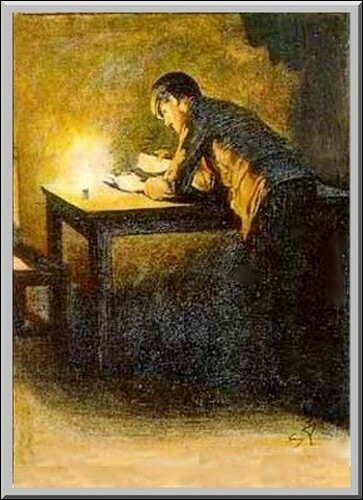 Then, with an angry gesture of his clenched hand, he closed the book, replaced it in the corner, and put out the light. He had hardly turned to leave the hut when Hopkins’s hand was on the fellow’s collar, and I heard his loud gasp of terror as he understood that he was taken. The candle was re-lit, and there was our wretched captive shivering and cowering in the grasp of the detective. He sank down upon the sea-chest, and looked helplessly from one of us to the other. I could see from Hopkins’s face that he never had; but Holmes was keenly interested. At last we were getting something positive, and yet it seemed a long gap between an absconding banker and Captain Peter Carey pinned against the wall with one of his own harpoons. We all listened intently to the young man’s words. “It was my father who was really concerned. Dawson had retired. I was only ten years of age at the time, but I was old enough to feel the shame and horror of it all. It has always been said that my father stole all the securities and fled. It is not true. It was his belief that if he were given time in which to realize them all would be well and every creditor paid in full. He started in his little yacht for Norway just before the warrant was issued for his arrest. I can remember that last night when he bade farewell to my mother. He left us a list of the securities he was taking, and he swore that he would come back with his honour cleared, and that none who had trusted him would suffer. Well, no word was ever heard from him again. Both the yacht and he vanished utterly. We believed, my mother and I, that he and it, with the securities that he had taken with him, were at the bottom of the sea. We had a faithful friend, however, who is a business man, and it was he who discovered some time ago that some of the securities which my father had with him have reappeared on the London market. You can imagine our amazement. I spent months in trying to trace them, and at last, after many doublings and difficulties, I discovered that the original seller had been Captain Peter Carey, the owner of this hut. “Naturally, I made some inquiries about the man. I found that he had been in command of a whaler which was due to return from the Arctic seas at the very time when my father was crossing to Norway. The autumn of that year was a stormy one, and there was a long succession of southerly gales. My father’s yacht may well have been blown to the north, and there met by Captain Peter Carey’s ship. If that were so, what had become of my father? In any case, if I could prove from Peter Carey’s evidence how these securities came on the market it would be a proof that my father had not sold them, and that he had no view to personal profit when he took them. “Is that all?” asked Hopkins. “Yes, that is all.” His eyes shifted as he said it. “Then how do you account for THAT?” cried Hopkins, as he held up the damning note-book, with the initials of our prisoner on the first leaf and the blood-stain on the cover. “Well, Watson, what do you think of it?” asked Holmes, as we travelled back next morning. “You really think that your solution must be correct?” asked Holmes. The detective’s face had grown longer and longer during Holmes’s speech. His hopes and his ambitions were all crumbling about him. But he would not abandon his position without a struggle. “I rather fancy that he is on the stair,” said Holmes, serenely. “I think, Watson, that you would do well to put that revolver where you can reach it.” He rose, and laid a written paper upon a side-table. “Now we are ready,” said he. “Show them in one by one,” said Holmes. “Yes, sir.” He took a sheaf of worn and greasy forms from his pocket. Holmes glanced over them and returned them. 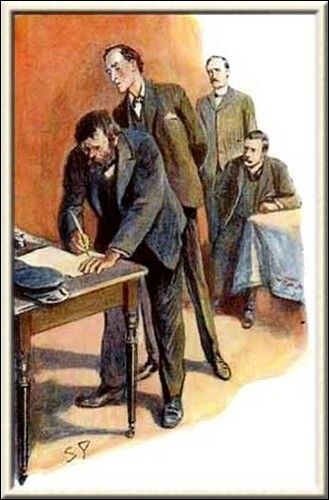 “Shall I sign here?” he asked, stooping over the table. “This will do,” said he. “How came you there?” asked Holmes. “I’ll tell it you from the beginning. Just sit me up a little so as I can speak easy. It was in ’83 that it happened—August of that year. Peter Carey was master of the SEA UNICORN, and I was spare harpooner. We were coming out of the ice-pack on our way home, with head winds and a week’s southerly gale, when we picked up a little craft that had been blown north. There was one man on her—a landsman. The crew had thought she would founder, and had made for the Norwegian coast in the dinghy. I guess they were all drowned. Well, we took him on board, this man, and he and the skipper had some long talks in the cabin. All the baggage we took off with him was one tin box. So far as I know, the man’s name was never mentioned, and on the second night he disappeared as if he had never been. It was given out that he had either thrown himself overboard or fallen overboard in the heavy weather that we were having. Only one man knew what had happened to him, and that was me, for with my own eyes I saw the skipper tip up his heels and put him over the rail in the middle watch of a dark night, two days before we sighted the Shetland lights. “Well, I kept my knowledge to myself and waited to see what would come of it. When we got back to Scotland it was easily hushed up, and nobody asked any questions. A stranger died by an accident, and it was nobody’s business to inquire. Shortly after Peter Carey gave up the sea, and it was long years before I could find where he was. I guessed that he had done the deed for the sake of what was in that tin box, and that he could afford now to pay me well for keeping my mouth shut. “I found out where he was through a sailor man that had met him in London, and down I went to squeeze him. The first night he was reasonable enough, and was ready to give me what would make me free of the sea for life. We were to fix it all two nights later. When I came I found him three parts drunk and in a vile temper. We sat down and we drank and we yarned about old times, but the more he drank the less I liked the look on his face. I spotted that harpoon upon the wall, and I thought I might need it before I was through. Then at last he broke out at me, spitting and cursing, with murder in his eyes and a great clasp-knife in his hand. He had not time to get it from the sheath before I had the harpoon through him. Heavens! what a yell he gave; and his face gets between me and my sleep! I stood there, with his blood splashing round me, and I waited for a bit; but all was quiet, so I took heart once more. I looked round, and there was the tin box on a shelf. I had as much right to it as Peter Carey, anyhow, so I took it with me and left the hut. Like a fool I left my baccy-pouch upon the table. “Now I’ll tell you the queerest part of the whole story. I had hardly got outside the hut when I heard someone coming, and I hid among the bushes. A man came slinking along, went into the hut, gave a cry as if he had seen a ghost, and legged it as hard as he could run until he was out of sight. Who he was or what he wanted is more than I can tell. For my part I walked ten miles, got a train at Tunbridge Wells, and so reached London, and no one the wiser.